The Grande Plage of Biarritz ranks high among Europe's most elegant beaches. ST-JEAN-DE-LUZ, France -- In the midst of what would prove to be the worst heat wave in a century, my family found ourselves in an unfamiliar corner of France last summer. While my wife, Sari, my son, Ben, then 15, and I hadn't planned to spend a week in the Inferno, we did have a particular reason for this visit, in addition to our usual travel curiosity. Two summers ago, we had hosted a visit from Guillaume Armantier, a 15-year-old French boy, who had been in the United States visiting his older brother, Olivier, a professor at the University of New York at Stony Brook. A mutual friend put us in touch, and Guillaume wound up staying with us for 10 days. Both avid golfers, Guillaume and Ben had enjoyed the exchange. Guillaume's parents, Guy and Annie, had invited Ben for a return visit to their home in Bayonne, the main city of an area in the southwest corner of France known the Pays Basque. Because Ben was a longtime student of French in the Pittsburgh magnet school system, the opportunity for some in-country acculturation seemed too good to pass up. This is the story of that trip last August. For thousands of years, the inhabitants of France's southwest Atlantic coast have maintained an identity more in common with their neighbors to the south across the Pyrenees foothills into Spain than with the rest of their country. Together, they are the Basques. Some think they are the last remnants of Europe's Cro-Magnon population. Euskara, the Basques' language, predates Indo-European influences, making it one of the continent's oldest living tongues. On both sides of the France/Spain border, Euskara is still printed on street signs and proudly taught in schools. Long before they paid fealty to kings in Paris or Madrid, peoples of the seven traditional Basque Provinces (three French and four Spanish) lived a separate life, coaxing a modest living out of the dry mountains and coastal foothills. Or they fared far out to sea in tiny boats in search of fish and whales. Basques were southern Europe's first ocean-going adventurers. Many of the great explorers of the 14th century, from Prince Henry the Navigator to Magellan, relied on Basques to navigate their voyages. Along this corner of the continent where rivers flowed from the highlands into the Atlantic, sea ports were established, from Bilbao and San Sebastian in Spain to St-Jean-de-Luz and Bayonne in France. Hard-working and practical with a bent to red-pepper culture and cuisine, the Basques have fiercely maintained their identity despite periodic invasions of armies and armadas and, over the last 150 years, visitors who come to enjoy the area's considerable natural beauties and amenities. Long, white-tipped breakers roll across the Bay of Biscay and unfurl themselves on the strand of sun-swept sand commas that punctuate the Atlantic coastline. As we discovered, Pays Basque is a place apart in more ways than one. Despite their independent attitudes, the Basque peoples have long been influenced by the royal families all around them and have endured their homelands being divvied up and exchanged as royal presents. Although not the earliest, perhaps the royal visitors who have had the most effect on this part of France were Emperor Napoleon III of France and his Princess Eugenie. In 1854, they became enchanted with the tiny whaling village of Biarritz. Napoleon had a charming villa erected for his beloved, a sprawling summer palace that he named the Villa Eugenie. Over the next two decades, their royal attentions transformed the humble village into a world-famous playground, a glittery, seaside escape for monarchs, moguls, and anyone else who could afford its grand hotels and haute casinos. In those days the festivities in Biarritz were never-ending -- champagne picnics, balls and carriage excursions up into the countryside. Queen Victoria, shahs, tsars -- they all came. In the Roaring '20s the new royalty arrived, the creative superstars of the day: Ravel, Stravinsky, Chaplin, Cocteau and Hemingway. Continental Europe's oldest golf course is draped languidly on the hill above the town. 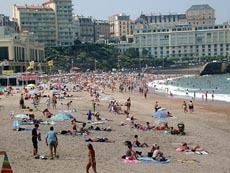 Biarritz maintained its reputation as France's swankiest beach town for nearly a century, eclipsed internationally after World War II by the Riviera's warmer Mediterranean waters. Nonetheless, the brightest star in the Cote Basque still maintains a very upscale ambience. Each summer its Centre Ville packs in a well-heeled crowd, their Peugeots and Mercedes lining every meter of curb space. Haute couture shops pose side by side and, several incarnations later, the Villa Eugenie still reigns. Now it is the sumptuous Hotel du Palais, seated regally above the Grande Plage, one of earth's most elegant beaches. Neat rows of brightly striped beach umbrellas line the wide tongue of sand between two rocky headwalls. The conversations under those umbrellas are mostly in French, with a smattering of British and German, but relatively little American. Guy, Olivier and Guillaume met us at the train station in Bayonne when we arrived that Friday afternoon. It was the day before France's annual mass August exodus, when everyone goes on vacation, especially to the beach. We felt ourselves fortunate to beat the legendary traffic jams that clog the country's roads. One other quick word about our travel arrangements. We had spent the night after our US Airways flight from Pittsburgh via Philadelphia in Paris' Hotel Meridian, literally across the street from the Montparnasse train station, having taken the 12-euro shuttle bus in from DeGaulle Airport. When we awoke the following morning somewhat recovered from our jet lag, we simply strolled over and caught the train. Having had a night to rest up after the flight, we found the four-hour trip to Bayonne on the TGV train an easy, comfortable way to arrive. Situated where the Nive River flows into the Adour a few miles from the sea, Bayonne was originally settled as a Roman garrison. It gained particular importance during the three centuries (1152-1451) that the English ruled this part of France. That situation had derived from the marriage of Eleanor of Aquitaine and King Henry Plantagenet, the couple who fathered England's King Richard the Lionhearted. 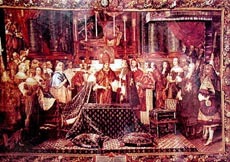 A detail from a historical display in the Basque church of St-Jean-de-Luz, where French King Louis XIV married the Spanish princess Maria Theresa in 1660. During their stay in Bayonne, the English built a Gothic cathedral to Saint Mary. After they pulled out, however, the Spanish and French contested the Pays Basque region, and Bayonne was again turned into a fortress city. A high wall was raised around the tight warren of medieval and Gothic buildings that lined the hill between the rivers. That situation lasted nearly 200 years, until the marriage of the Spanish Infanta Maria Theresa and Louis XIV of France settled the border between the two countries. After that, Bayonne's strategic importance diminished, but it maintained prosperity and purpose as a port and trading center. Although it has grown into a thriving market town of 50,000, as well as the administrative capital of the region, it never let its Gothic old town or fortifications be compromised. The grid of narrow, cobbled streets is flanked by venerable five-story, white-painted stone buildings. Small, neat shops, bistros and tiny restaurants occupy the street level, with their owners and residents living in the upper stories. In addition to the cathedral, Bayonne boasts the excellent Leon Bonnat Museum, which houses an impressive collection donated by the painter, who lived and worked in the city. In addition to his own paintings, Bonnat's collection includes works by Goya, Durer, Michelangelo and Raphael, as well as John Constable's "Hampstead Heath." The Basque Museum, located in Bayonne's old town, provides a complete overview of Basque history and culture. Guy showed us around their home, a neat, stucco-walled, two-story structure on a quiet street in a residential neighborhood of Bayonne. Weeks away from retiring after a long career in the tax office, where his wife also worked, Guy had taken the afternoon off work to greet us. After Ben was settled in, Guy drove us out for a quick tour of the countryside. We drove out to Ainhoa, a typical Basque hill village of half-timbered walls and red-tiled roofs. On the afternoon of our visit, strings of drying red peppers were draped from many windowsills, and men of the village were playing pelote (the traditional Basque handball-like pastime) on the court that used a wall outside of the town's church. Then it was back to their house for dinner, a grill in the back yard, where we met Annie, a smiling, energetic woman, several years younger than her husband. During dinner, we all had a chance to chat, with the younger members acting as translators for the older ones. As the evening progressed, Guy and Annie kept mentioning the Fete de Bayonne, which, unbeknownst to us, happened to be in full flow that night. About 11 p.m., they decided it was time to go. Although we'd never heard of it, the Fete de Bayonne takes place annually the first week of August and is similar to another famous Basque bacchanalia, the festival of San Fermin, held in Pamplona, Spain, each July. Like Pamplona, Bayonne's fete involves fighting bulls, but rather than having them released in the streets, in Bayonne they're penned in an enclosure in the town center. Red-bereted partiers leap over the fence and dodge the increasingly frenzied animals for a few minutes before leaping back out. There are other colorful displays of Basque culture during the fete, but mostly for 120 nonstop hours it's a full-scale street celebration, with tens of thousands of revelers of all ages dressed in white slacks and shirts, with red berets, neck scarves and waist sashes. The Armantiers were enthusiastic about showing us the fete, so, even though it already was well past our normal bedtimes, we went along. 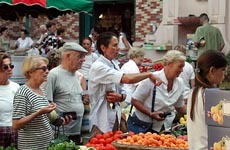 Fresh food is sold daily in the open marketplace of St-Jean-de-Luz. What a scene! The narrow streets of the old town thronged with men and women in white and red. Swigging from sangria bottles, consuming various versions of sausage and fried dough, they generally seemed to be having a great time. They partied prodigiously and almost around the clock, accompanied with brass bands and heavier metal music. Boisterous groups joined spontaneously in long conga lines that snaked their way over the cobblestones and across the ancient bridges that arch over the river Nive. Despite all the energy and alcoholic consumption, everyone seemed surprisingly good-natured, with no trace of aggression. Wandering among the streets packed with frivolity was a slightly surreal experience for us, especially as we were still somewhat jet-lagged, but as we arrived back at the Armantier house about 3 a.m., we were exhausted but feeling festive. The next afternoon, as Ben began his week's stay with the Armantiers, Sari and I picked up a rental car in Bayonne and managed to navigate our way about 20 miles south along the coast to the port of St-Jean-de-Luz, no small accomplishment considering the tidal wave of visitors now flooding the roads. We had reservations in the Hotel Central, which turned out to be a tidy, three-star tourist hotel situated across from the train station, a five-minute walk through the old town to the beach. With its well-maintained, medieval beachfront buildings, St-Jean (or, Donibane Lohitzun in Euskara) is the most attractive resort town in this corner of France. A naturally sheltered harbor, it has been a fishing port for centuries and boasts a colorful history of pirates, whalers and royal grandeur. The marriage of Louis XIV and Maria Theresa in 1660 took place in the village, a lavish affair that still echoes in its oldest buildings. That includes the Basque Church, where the ceremony was held, along with the houses where the royals and their entourages stayed. One of those buildings today houses a wax museum which neatly tells the story of St-Jean's royalty and pirates. 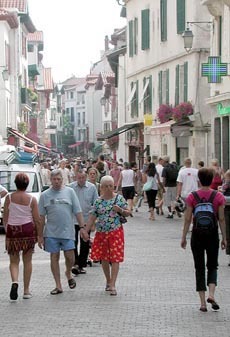 In summer the streets of St-Jean-de-Luz throng with vacationing French people. Despite its early fame, St-Jean never let its reputation go to its head or compromise its architectural authenticity. A catastrophic tidal flood in 1749 destroyed dozens of buildings, but the fishing industry kept the town afloat, and it continued to prosper, picking up some of Biarritz's tourist overflow and becoming a somewhat less fashionable resort. The composer Maurice Ravel, born in the nearby village of Ciboure in 1875, spent much time in St-Jean, completing his "Bolero" there in 1928. The musical institute in St-Jean which bears his name is the scene of an annual international festival. These days from early spring to late fall, the focus of the town is the broad mile-long curve of sand along the base of the sea wall built to shelter the old port. Though not a beach person by nature, I can attest that is possible to spend hours at a time on the broad beach or the narrow promenade atop the sea wall, pleasantly sipping wine and studying the steady tide of tanned French people of all ages, sizes and shapes, who though seemingly well-endowed with savoir-faire were by no means stuffy. Many of the streets of the old town that lie between the beach and the harbor are for pedestrians and motor scooters. Fresh food is sold daily in St-Jean's market square, and dozens of small restaurants and shops create the ambience of a very classy mall. It also boasts a small casino and a posh spa (with a wide variety of water treatments), but compared to Biarritz, St-Jean is low-key and family-oriented. Its understated elegance makes St-Jean the sort of offbeat beach escape that never goes out of style. Even during the week we spent there, when temperatures were a record highs and summer visitation was at its peak, St-Jean was charming. From late morning to early evening, local men and boys threw boules on the rocky pitches behind the train station. Parking was free in the adjacent lots, but finding a space was always problematic, so that when we had one, we weren't quick to move the car. Although the narrow streets of the old town thronged with visitors, it also provided quiet, shady corners to retreat, a few of which were even air-conditioned. We tried half a dozen restaurants during our time, mostly with recommendations of our hotelier. In fact, the only less-than-superb meal we had was the place we picked ourselves. Few small French hotels have air conditioning, so our bedroom was hot, and a small fan provided by our host proved a blessing. The heat, which hovered near 100 degrees during the day, also forced us to keep our window wide open at night, which proved noisy, as the restaurants and bars on the street below stayed busy and loud well into the wee hours. To avoid getting totally toasted, we generally confined our beaching to the morning and late afternoon. During the heat of the day, we were able to get out and explore the countryside in our air-conditioned rental car. That Sunday, for example, we drove out to the Grottoes de Sare, a warren of cool caves about 15 miles into the hills from St-Jean, with numerous traces of its Neolithic residents. On the way back, we stopped at La Rhune, a nearly 3,000-foot peak that is the last leg of the Pyrenees. The steep, 30-minute ride on the two-coach, cogwheeled train to the top (Le Petit Train de la Rhune) grinds slowly up the steep profile, past grazing sheep and wild ponies. Both of the peak-top commissaries were bustling with late lunchtime crowds, and the view encompassed the entire, sun-blasted coastal sweep of Pays Basque. Despite the heat of the day, we decided to walk down La Rhune instead of talking the train, which turned into a dusty, three-hour ramble that tested our marital peace. Another day, we checked out several tourist locations along the coast to the south toward the Spanish border, including the Chateau d'Urtube, an estate that has been in the same family since 1341, housing kings and, during the Napoleonic Wars, the Duke of Wellington. The present Count d'Urtube, an engaging though weary-looking man in his mid-40s, sold us tickets and let us wander through the antique-filled rooms, while he lamented how hard it was to get good help these days. Though less historic, the nearby Chateau d'Abbadie, a 19th-century creation by the famous architect Viollet-le-Duc that commands a high bluff over the sea, is a more organized architectural folly. A third day we headed up the coast and found a place to park in Biarritz, no small feat. We sauntered along the Grande Plage, with its rows of beach pavilions, and wandered through tunnels cut through the rocks and across bridges out to stony outcroppings. We bought ice cream cones and checked out the lobby of the Hotel du Palais. But the Grande Plage scene was too intense for our pedestrian tastes, so we decided to move on to the beaches at Anglet, a bit farther north along the coast. A surfing competition was in progress there, which provided a diversion during the late afternoon hours we spent reveling in the cool Atlantic waters. The most significant excursion we took during the week was when we drove two hours southeast into Spain and visited the Guggenheim Museum in Bilbao. With Common Market integration and institution of the euro, driving from France to Spain has become a non-event, more like going from one state to another than crossing an international border. After tossing a few coins into the toll booth at the border at Irun (and several other times along the way), we were on our way, with no customs formalities at all. In fact, it was so simple that we had no problem, despite having neglected to take our passports with us on the drive. We zoomed down the highway, and an hour and a half later we were standing in line to buy admission to Bilbao's world-class museum. When it opened in 1997, the Frank Gehry-designed structure became an instant international sensation, catapulting the proud but often ignored industrial city on the Nervion River into a must-do destination for art lovers. With its sinuous, titanium clad exterior, the huge museum itself is an impressive edifice, but its interior spaces were equally remarkable. Its high-ceilinged, almost industrial-like galleries were a perfect venue for the many Alexander Calder mobiles on display. We were also surprised by the city of Bilbao itself, with wide boulevards lined with a collection of stately Old World buildings and cutting-edge modern architecture. The towering hills that rose right out of the river reminded us of Pittsburgh, and we drove around exploring the town for nearly an hour, regretful that we didn't have time for a longer visit. However, rather than going back to St-Jean on the highway, we decided to take the scenic route. So we drove up through the town of Guernica, made famous by the brutal, April 1937 attack during the Spanish Civil War, when at the behest of Francisco Franco, Hitler's Luftwaffe bombed and strafed the Basque village for hours. Pablo Picasso painted a masterwork of the same name. We stayed in the Hotel Central, (3 Blvd. du Commandant Passico, St-Jean-de-Luz), which has a three-star rating. Its 34 clean, cozy double rooms range in price from 58 to 70 euros. At the exchange rate back then ($1.12 per euro), that was about $78 per night, for two, including a nice continental breakfast. At today's rates (more like $1.30 per euro) it's closer to $90. For information and reservations: www.hotel-central-stjeandeluz.com. French National Tourism: www.franceguide.com or 1-410-286-8310. Bayonne: www.bayonne-tourisme.com. The 2004 Fete de Bayonne will be held Aug. 4-8. Petit Train de la Rhune: www.rhune.com. Although the center of modern Guernica has some charming older buildings and a museum devoted to the historic bombing, we were more interested in seeing the Urdaibai, a UNESCO Biosphere Reserve. It spreads along both sides of the Mundaka River estuary as it widens into the Bay of Biscay. On the right bank, long sand beaches and salt marshes appear and disappear with the tides, which also create some of the planet's best surfing waves. The left bank of the estuary is far less developed. With no idea of what we were getting into, we started up the road as it wound up into the coastal mountains toward the village of Gautegiz-Artega, with its ancient castle and 16th-century church. From there the road narrowed and rose up to and around a magnificent coastal corner and two stunning villages, Ibarrangelua and Elantxobe, with precipitous, sweeping views of the Atlantic. Then the road narrowed even more, to a lane and a half with tight, blind hairpin curves that twisted through deep woods and clung to the edge of cliffs that plunged 1,000 feet into the sea. On those moments when I dared take my eyes off the road in front of me, I was overwhelmed by Big Sur-like vistas. It was clear that we were hanging on the very edge of a continent. At intervals, the road dived down to the water's edge and snaked through coastal resort towns and estuarial fishing villages of which I had never heard, let alone knew how to pronounce. Natxitua, Ea, Ispaster, Lekeitio, Ondarroa and Zumaya, Getaria, Zarautz and Orio each looked like just the sort of place to get out for a quick dip or to spend a week at the beach. The city of San Sebastian was particularly inviting. However, we had late dinner reservations back in St-Jean, so we pushed on. Our drive along the Gulf of Vizcaya had been white-knuckle all the way, but it was an afternoon I'll remember with great fondness. Before we knew it, our week in the heat of Basque country was over, just as we had begun to know our way around. Still, it was time to pick Ben up at the Armantiers'. Despite the oppressive temperatures, the boys had managed to get out on the golf course and the beach several times, but they had also spent plenty of time doing what teenage boys will do when left to their own devices -- hanging inside playing video games. Although he claimed to have enjoyed his time with Guillaume, Ben also seemed very glad to see his parents. For a teenage boy, that in itself is remarkable. Certainly, his language skills had been tested. We suspect the experience contributed to the "A" he got in French this year.